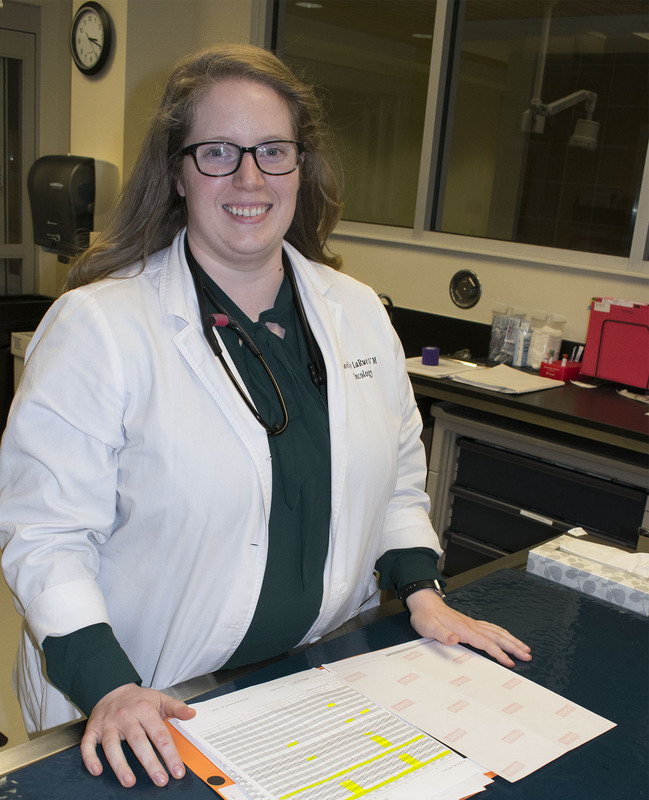 Dr. Michelle LaRue, a resident in the Oncology Service at Auburn University’s College of Veterinary Medicine, has received a grant from the Veterinary Cancer Society to support her research in the area of feline cancer. Her focus is on T-regulatory cells (Tregs), which are critical to the maintenance of immune cells that help to prevent autoimmune diseases such as Lupus and various forms of cancer. Dr. Michelle LaRue, a resident in the Oncology Service at Auburn University’s College of Veterinary Medicine, has received a grant from the Veterinary Cancer Society to support her research in the area of feline cancer. Dr. LaRue has been involved in her investigations for the past year and a half. “I am conducting research in the hope of expanding our knowledge about feline cancer and its treatment,” she said. Her focus is on T-regulatory cells (Tregs), which are critical to the maintenance of immune cells that help to prevent autoimmune diseases such as Lupus and various forms of cancer. “T-regulatory cells are present in everyone and in all species,” Dr. LaRue said. Tregs typically are more evident around cancerous tissue and in patient’s blood, Dr. LaRue explains. High levels of Tregs in the tumor microenvironment are associated with poor prognosis in many cancers, such as ovarian, breast, renal, and pancreatic cancer. This indicates that Tregs suppress certain cells and hinder the body’s immune response against the cancer. 1) Do T-regulatory cells increase in feline cancer patients as they do in other animal models? 2) If so, can they be decreased to help target and combat cancer cells in feline patients? Cats are vastly different from dogs in the types of diseases and viruses that attack their systems, Dr. LaRue explains. Cats are subject to FIV (feline immunodeficiency virus) and FeLV (feline leukemia virus) which can be present in their DNA and cause decreases in their immune response. These are different kinds of diseases than those found among dogs and rodents, and the field of feline oncology still has a void in information and knowledge about treating these and other feline-specific diseases. “Hopefully, we will be able to use our results as a proof-of-concept study and to discover if these T-regulatory cells show similar responses and changes in cats as they do in other animal cancer patients,” Dr. LaRue said. Dr. LaRue is collaborating with researchers at North Carolina State University, using its flow cytometry lab and to examine DNA to categorize cell markers that identify certain types of cancer. She presently is in the process of enrolling patients for her research. Enrollment inquiries should be made to the Oncology Service at the College of Veterinary Medicine, 334.844.4690. The Veterinary Cancer Society (VCS) was formed in 1976 by a small group of veterinarians who wanted to establish a professional organization dedicated to veterinary oncology. VCS is a non-profit educational organization incorporated in Illinois. Its more than 800 members include specialists in medical, surgical, and radiation oncology, internists, pathologists, pharmacologists and general practitioners worldwide. Dr. LaRue received her DVM from Texas A&M University. She completed an internship for small animal medicine and surgery at Auburn, and a medical oncology internship at Louisiana State University. Following her residency at Auburn, Dr. LaRue plans to enter specialty-focused private practice.